Here's my card for this week's (or last week's) Bellarific Friday asking for ANYTHING with Nature and also for Beate's Weekend Sketch Challenge #102. 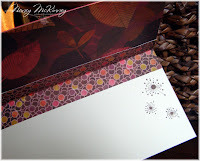 I thought the embossing folder from the cuttlebug cut/emboss combo 'friends forever' set went perfectly with kenya KETTO and her sparkles. To tie the orange and pink together, I sponged Brilliance Rocket Red Gold ink on the embossed panel and the edges of the cream focal image, cut with nesties. My Peony nestie gave the dark chocolate layer just the funkiness required. Inside I've repeated the patterned paper from the Basic Grey Indian Summer collection and kenya KETTO's sparkles. 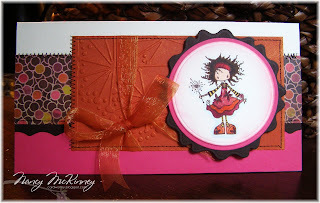 Nancy this is stunning - it's nice to see you back stamping now that Henri's in school you have a little "free" time? !